Published on October 2, 2017 by Martyn. Be the first to comment! It’s especially exciting to be appearing at the festival alongside two writers as renowned as Maggie Gee and Jacob Ross for what promises to be a lively evening of political and literary debate. The three of us will be reading extracts from, and discussing, our short stories, which have been included in Protest: Stories of Resistance, the latest anthology by Comma Press. Maggie’s story revolves around the night-cleaners’ strike in Hoxton, London, in the early 1970s; Jacob’s focuses on the New Cross Fire and Brixton riots a decade later, while mine is centred on the so-called Battle of Orgreave during the 1984-85 miners’ strike. For the anthology, Comma paired twenty writers with expert consultants – social and political historians and academics – each of whom has written an afterword which sets the fiction in its historical context. For my story, “Withen”, I collaborated with Prof. David Waddington of Sheffield Hallam University, who was present as an academic observer on that infamous day when riot police broke up a mass picket outside the coking plant at Orgreave, South Yorkshire. Other authors whose stories appear in the anthology include Sara Maitland, Kit de Waal, Frank Cottrell-Boyce, Alexei Sayle, David Constantine and Courttia Newland, with protest topics ranging across seven centuries, from the Peasants’ Revolt to Greenham Common, the Aldermaston March to the Diggers, the Suffragettes to the Anti-Iraq War demo. 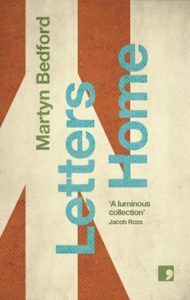 “Many of the stories explore the long-term legacy of the events upon its characters: perhaps none more so than Martyn Bedford’s skilful, sensitive depiction of estrangement caused by the divisiveness of the 1980s mining strikes. Martyn Bedford’s “Withen” uses flashback to devastating effect to lay out the impact on a single family of Thatcher’s pit closures: the ending of this story is one of the most chilling we can recall in this or any collection. “Protest Lit”, event 92 at this year’s festival, is at St Margaret’s Hall, Queen’s Road, Ilkley, from 7.30-8.30pm, on Friday October 6th. Tickets priced £7 (£5 concessions) can be obtained via the Ilkley Literature Festival website – click here – or simply pay at the door. Published on September 23, 2017 by Martyn. Be the first to comment! I’m looking forward to a trip to Manchester this week for a celebration of independent publishing in the north of England. 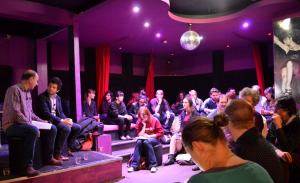 I’ll be one of eight writers sharing a stage at the first Northern Fiction Alliance roadshow, to mark the formation of a new collective of indie presses. The event, from 6-8pm on Tuesday 26th September, at Waterstones, Deansgate, will showcase a variety of NFA presses and books, with talks and readings from editors and authors. I’ll be reading an extract from “Withen”, my story about the battle of Orgreave, which is published in Protest, the latest anthology from Manchester-based Comma Press. Tickets cost £3 and include a glass of wine or soft drink on arrival. There will also be a 10% discount on any books purchased on the night published by any of the presses in attendance. For more information, email commapublications@yahoo.co.uk, events.manchester@waterstones.com or tweet us @waterstonesmcr. Published on June 13, 2017 by Martyn. Be the first to comment! In these febrile political times, it seems apt for a new anthology of fiction about resistance to be hitting the bookshelves (virtual and physical). Protest: Stories of Resistance is the latest book of short-fiction to be published by the excellent Manchester-based independent Comma Press . . . and I’m pleased and honoured to be among the contributing authors. In putting together this anthology, editor Ra Page paired twenty writers with leading social historians and other experts, to produce stories and commentaries ranging across centuries of political dissent – from the Peasants’ Revolt to the Poll Tax riots, from the Suffragettes to the anti-Iraq War demonstration, from the Diggers to Greenham Common. For my story, Withen – which centres on the Battle of Orgreave, during the 1984-85 miners’ strike – I worked collaboratively with Prof. David Waddington, of Sheffield Hallam University, who assisted my research and has written a factual afterword to accompany my fictional response to those events. Other contributing authors include: Kate Clanchy, David Constantine, Frank Cottrell-Boyce, Maggie Gee, Matthew Holness, Sara Maitland, Courttia Newland, Alexei Sayle and Kit de Waal. I’m proud to see my name – and my story – alongside theirs, and to be making my small contribution to the political discourse generated by this recasting of social history through the prism of imaginative literature. 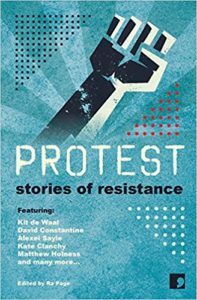 Protest: Stories of Resistance (hardback, £14.99) is officially published on July 6th but is already available online direct from Comma Press at a discount price of £13.50. Click here to visit the book’s page on the Comma website. Published on May 8, 2017 by Martyn. Be the first to comment! 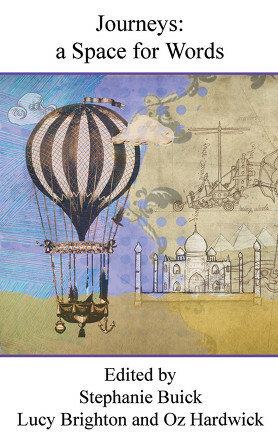 As a former fellow of the Royal Literary Fund, I was recently invited to contribute an essay to the RLF’s website about the way in which the germ of an idea can evolve into piece of fiction. I chose to reflect on the process by which I conceived, researched and wrote my latest short story, “Withen”, which is centred on the Battle of Orgreave, during the 1984-85 miners’ strike. The story is being anthologised by Comma Press in Protest! Stories of Resistance, to be published later this month. In the meantime, if you’d like to read my essay on the story’s genesis – and how it all began more than thirty years ago . . . in Hong Kong! – please click on this link to the RLF website. Published on April 22, 2017 by Martyn. Be the first to comment! I’m looking forward to a trip to Liverpool next month to take part in the 2017 Writing on the Wall Festival, where I’ll be helping to launch a new anthology of short fiction about political dissent and resistance. The anthology – Protest! 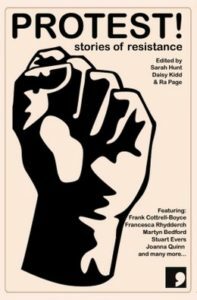 : stories of resistance, published by the Manchester-based independent Comma Press – includes my latest story, Withen, which centres on the Battle of Orgreave during the 1984-85 miners’ strike. For the book, Comma Press commissioned twenty writers – including Frank Cottrell Boyce, Kit de Waal, Alexei Sayle, Maggie Gee, Sara Maitland and Courttia Newland – to bring to life crucial moments of protest in British history through the medium of fiction. The stories range across topics as diverse as the Suffragettes, the Peasants’ Revolt, the Brixton riots and the civil rights movements of the 1960s. Each story has been written in consultation with a specialist historian or, in the case of more recent protests, in partnership with activists who helped organise them. The resulting fictions are accompanied by short essays by the historians and activists, contextualising the events and offering insights into the political climates that produced them. For my story, I worked closely with Prof. David Waddington, a social historian from Sheffield Hallam University, who was an academic observer at Orgreave. At the festival, I’ll be sharing a stage with Stuart Evers and Jacob Ross, whose stories also appear in the book. The event is at 7.30pm on Thursday May 25th, at Blackburne House, Blackburne Place, Liverpool, L8 7PE. Tickets (£6/£3) can be obtained via these links to Comma Press and the Wowfest site. Published on May 31, 2016 by Martyn. Be the first to comment! from a creative-writing exercise – tells the tale of a man troubled by unbidden memories after he pulls on someone else’s coat when leaving a party. It has been included in Journeys: a Space for Words, the second annual anthology from Leeds Trinity University tutors, students and guest contributors. The book, edited by two of LTU’s Creative Writing MA students, Stephanie Buick and Lucy Brighton, and English lecturer and poet Oz Hardwick, has been released by Indigo Dreams Publishing. It is available directly from the publisher via this link or from Amazon via this link. Published on October 29, 2015 by Martyn. Be the first to comment! The anthology, published by the very marvellous Manchester-based independent, Comma Press, is the latest in their series in which fiction writers collaborate with researchers and academics to produce science-themed stories and accompanying afterwords. There are fourteen stories, from a strong line up of specially commissioned writers, including M.J. Hyland, Deborah Levy, Sara Maitland, Adam Marek and Adam Roberts. The standard is high throughout but I was especially taken with Maria Hyland‘s A Sleeping Serial Killer and The Raveled Sleeve of Care by Adam Roberts. Many of the scientific afterwords make fascinating reading in themselves. For my contribution, I was paired with Ed Watkins, Professor of Experimental and Applied Clinical Psychology at the University of Exeter, a specialist in mood disorders. With his help, I researched and wrote a story centred on the interconnections between depression and hypersomnia, or excessive sleep. Narrated by Kim, a technician in a sleep laboratory, My Soul to Keep is the tale of a young woman, Charlotte, who is entering her 365th day of uninterrupted sleep, confounding medical science and all attempts to wake her. Meanwhile, in the street outside the lab, hordes of Charlotte’s devotees have set up a sleep camp and are chanting her name, convinced that she is some kind of living (or sleeping) goddess. Me on stage with Dr Simon Kyle of Oxford University at the Manchester Science Festival. Spindles was supported by the Wellcome Trust and is edited by Ra Page, of Comma Press, and Dr Penelope Lewis of the University of Manchester’s NaPS (Neuroscience and Psychology of Sleep) lab. For more details about the collection or to order a copy at a discount price of £8.75 (RRP £9.99), please click on this link to the Comma website. Published on October 17, 2015 by Martyn. Be the first to comment! An early bedtime beckons later this week when I’ll be helping to launch a new short-story anthology on the theme of sleep . . . at the appropriately named B.E.D bar, in Manchester. 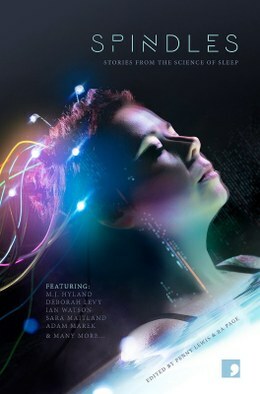 The event, part of the 2015 Manchester Science Festival, celebrates the publication of Spindles: Short Stories from the Science of Sleep, by Comma Press, which includes my most recent story, My Soul to Keep. I’ll be sharing a stage with the anthology’s co-editors, Ra Page, of Comma Press, and Dr Penelope Lewis, from the University of Manchester, along with another of the book’s contributors, Dr Simon Kyle, of the University of Manchester’s Neuroscience and Psychology of Sleep Lab (NaPS). As well as a panel discussion and readings, there will be time for Q&A, including questions on sleep-related topics submitted before and during the event by tweet, email or Facebook message. Spindles comprises a selection of fourteen specially commissioned sleep-themed stories from fiction-writers – including M.J. Hyland, Deborah Levy, Sara Maitland, Adam Marek and Ian Watson – with accompanying commentaries by a range of experts in related fields of study which put each story in its scientific context. For my story, on the connection between depression and hypersomnia (excessive sleep), I was paired with Prof. Ed Watkins, a researcher in clinical psychology at the University of Exeter, whose help was invaluable in providing the factual underpinning for my fictional foray. The launch event takes place at 6.30pm on Thursday October 22nd, in the B.E.D bar, underneath Tribeca, at 50 Sackville Street, Manchester, M1 3WF. Entry is free and children are welcome – until 8pm, when, of course, it will be their bedtime. For further details about the event and the Manchester Science Festival, please click on this link, and for more information about the anthology, here’s a link to the Comma Press site. Published on May 17, 2015 by Martyn. Be the first to comment! Two of my short stories are being reissued on Comma Press’s new digital publishing platform, MacGuffin, when it launches in June. The stories – Letters Home and A Missing Person’s Inquiry – are free to read in text form or to listen to. The audio version of the first story is voiced by a professional actor while the second is a recording of a reading I gave at a live-literature event in Manchester. MacGuffin is a free website and app for user-generated content (fiction, poetry, non-fiction), enabling published and unpublished writers to upload their work for readers to access and read or listen to via PC, smartphone or tablet. Although the platform doesn’t go fully live until next month, to have a sneak preview of the web browser version follow this link.